The production I saw from the Short Case Theatre company was a display of great talent and humour. In between laughter I became quite involved in the story, deftly delivered through sharp dialogue. I am constantly amazed at the breadth of ability in the medical profession and urge anyone to see this show while they can. A great night out for a great cause. See below for more information about the show. Click here to purchase tickets. This entry was posted in Uncategorized on May 13, 2013 by shortcasetheatre. World of Chickens is the debut production of the Short Case Theatre Company. 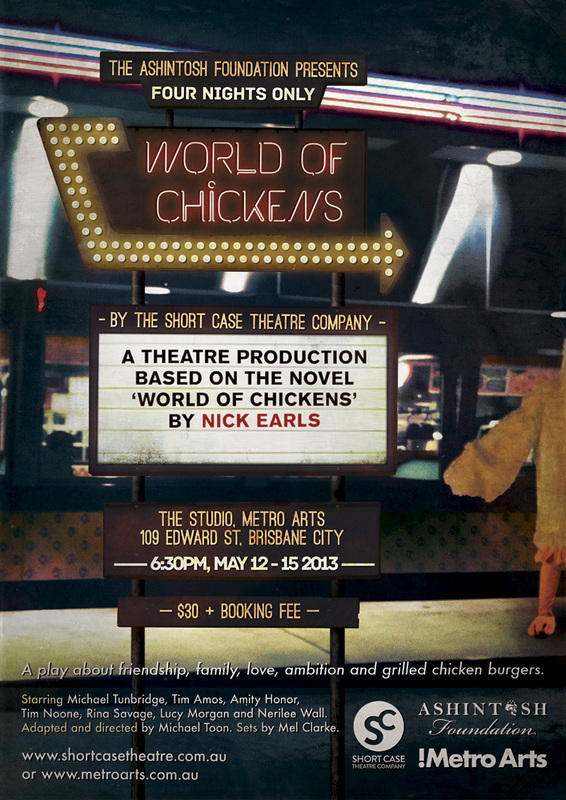 An adaptation of the popular Brisbane novel about 2 medical students and their complicated relationship with their employer at a takeaway chicken shop, Ron Todd’s World of Chickens. Phil and Frank are very good friends, but very different people and Ron’s family offer far more than they counted on working part-time to support their studies at the Mater Hospital. This is the first theatrical adaptation of the 2001 novel World of Chickens and Short Case Theatre Company is honoured and delighted to bring it to life for the enjoyment of Nick Earls’ fans, supporters of the UQMS and Ashintosh Foundation, lovers of the stage and those who enjoy the lighter side of medicine and life alike! This entry was posted in Uncategorized on May 4, 2013 by shortcasetheatre.